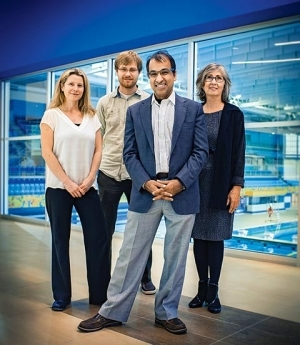 Clinical psychologist Dr. Tayyab Rashid (centre), creator of the strengths-based Flourish program is a strong proponent of using positive treatments to cope with stress and mental illness. The idea of “strength of character” has a kind of old-fashioned feel these days. But at U of T Scarborough, it is flourishing. Students recently filled The Hub in the Instructional Centre for an intensive dive into their own strengths as part of a global event called Character Day. Worldwide, some 90,000 events were held in 124 countries to highlight how people can develop such positive character traits as empathy, grit, humour and courage to make their lives better, based on scientific research. Participants focused on three big sources of stress for students — Fatigue, Fitting In, and The Future. They did art-based exercises exploring character and held round-table discussions to recommend positive ways of addressing those anxiety-inducing F words. First year Arts student Sylvie Stojanovski said she was drawn to the event because “it was focusing on strengths, and relating that to stress. It was dealing with issues that are part of my daily life. Leading the organizing team was Health and Wellness Centre clinical psychologist Dr. Tayyab Rashid, creator of the strengths-based Flourish program and a strong proponent of using positive treatments to cope with stress and mental illness. Rashid says the Health and Wellness Centre is the only student counselling centre in Canada to assess character strengths as well as symptoms at the start of a person’s treatment, and the Flourish team teaches students how to use strengths to enhance their academic and physical resilience. Increasingly, Flourish is taking on an international profile with its positive outlook. For the global side of Character Day, Rashid sat down for an online video interview about his approach, streamed live around the world via social media and the website of Let It Ripple, the San Francisco-based organizer of the three-year-old annual event. Like Rashid, the organization cites as a major influence the work in positive psychology of American academics Martin Seligman and Christopher Peterson. Let It Ripple also now links to a major resource compiled by Rashid on the Flourish website, showing scores of activities students can undertake related to 24 character strengths—such as bravery, gratitude and persistence—as well as films they can watch and books to read. “I don’t think there is any website in the world that has this extensive a set of activities,” says Rashid.